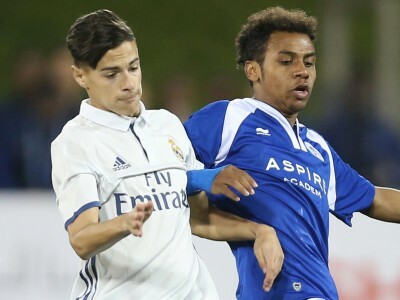 Aspire Academy produced their finest performance in Al Kass’ history to come from behind and defeat Red Bull Salzburg by two goals to one in a dramatic semi-final that lit up the Aspire Zone. Red Bull had deployed Aminu Mohamed, hero of their 3-2 victory over PSG, on the left of a two-man attack. Meanwhile, Aspire had Yusuf Yusuf, himself the scorer of a wondrous strike in the previous round, leading the line. But it was midfielder Hashim Ali who came close to opening the scoring on seven minutes, when he reacted smartly to a headed clearance to volley a powerful first time effort from 25 yards that flew inches over the bar. 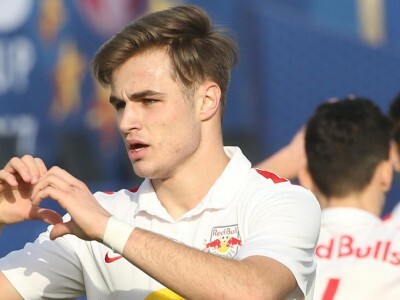 The local side had largely succeeded in keeping Aminu quiet during the early stages, but on 20 minutes another threat emerged in the shape of Dominik Szoboszlai. The midfielder picked the ball up 35 yards out in the inside left channel and cut inside before unleashing an unstoppable drive into the top corner of the helpless Mahmoud Abunada’s net. Suddenly, Aspire’s powers of recovery were put to the test, having fallen behind for the first time in the tournament. Just as Aminu had been anonymous up to this point, so Aspire’s Yusuf struggled to get into the game, with Red Bull’s back line closely watching his every move and responding forcefully whenever he threatened to get on the ball. 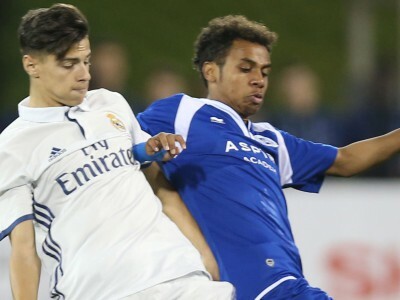 At the same time, Aspire’s defenders were also performing well, never more so than on 27 minutes when Red Bull’s Aldan Aganovic broke into the area down the right and evaded several tackles before Saleh Binhalabi intervened with a superbly timed challenge to win the ball cleanly. 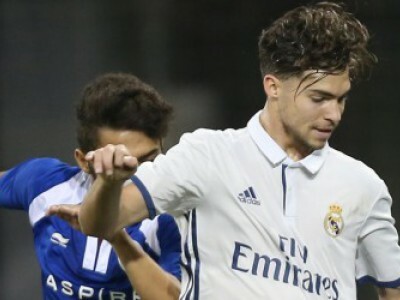 However, Aganovic’s boundless energy and powerful running were causing problems, as the Academy found themselves penned in to their own half for long periods. Deep into added time at the end of the first 45, Abunada saved Nikola Stosic’s stinging drive smartly to keep the deficit to a single goal, but is was clear that Aspire would need to step up their attacking threat to stand any chance of reaching the final. With this aim in mind, coach Bruno Nogueira made a double substitution at the beginning of the second half, bringing Ahmed Alganehi on for Nasser Alyazidi and Abdulrasheed Ibrahim for Yusuf, who was perhaps suffering following some earlier rough treatment. Aspire instantly appeared reenergised, and came close to equalising on 49 minutes when Mohammed Al Naimi rose highest to power a header inches wide from Khaled Saleh’s inviting free kick. Soon after, Ibrahim was set free on the inside left channel and beat his man before delivering a shot of such ferocity that Red Bull keeper Daniel Antosch needed two attempts to bring the ball under control. Aspire were enjoying their best spell, and suddenly it was the turn of Salzburg’s defenders to stand firm in the face of repeated attacks. But on the hour mark they finally succumbed, when an inviting ball over the top was latched onto by the onrushing Ibrahim, who took a touch before hammering home to level the score. The local youngsters were suddenly in the ascendancy, as the equaliser appeared to take the wind out of Red Bull’s sails. 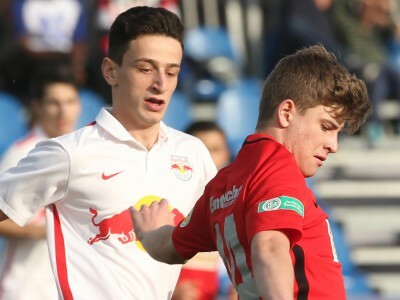 Aspire’s preferred tactic – to win the ball in midfield and release Ibrahim as quickly as possible – had already paid off, and Salzburg were struggling to keep the pacey striker at bay. However, as confidence levels grew, so each of the Academy players began to express themselves with neat interplay and accurate passing. Red Bull were reduced to attempting shots from distance, as on 71 minutes when Aminu’s long-range attempt came to nothing. Aspire were defending resolutely, their commitment typified by Nasir Baksh, who was cautioned for a crude hack on Szoboszlai, who wasted the resulting free kick. As the game entered the final quarter of an hour, Aspire looked to be firmly in control, if only they could find a second goal that their improved performance warranted. And they were handed a gilt-edged opportunity on 78 minutes when the referee judged that Ahmed Sebaie had been impeded as he strove to get on the end of Ahmed Al-Hamawende’s header across goal. 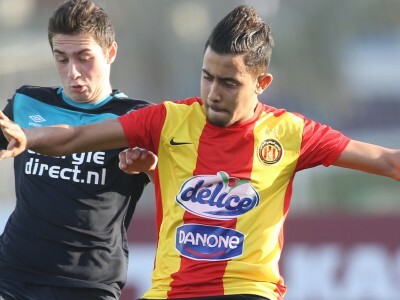 Captain Nasser Alrahak showed admirable courage to score low to his left and spark scenes of delirium. 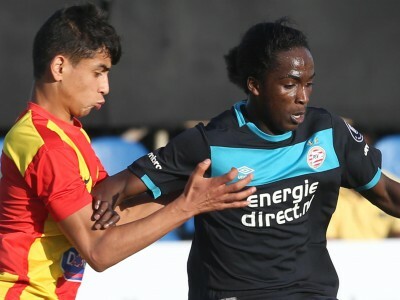 Red Bull’s night went from bad to worse soon afterwards, when playmaker Ousmanne Diakite was given a straight red card for serious foul play, after frustration got the better of him. However, his teammates almost found a way back into the game moments later when left back Benjamin Wallquist’s speculative cross from wide on the flank evaded everyone and cannoned out of the far post. With time ebbing away, Dario Kolobaric powered into the area on the right and looked to round Abunada, who managed to get a hand on the ball and avert a certain goal, or penalty. 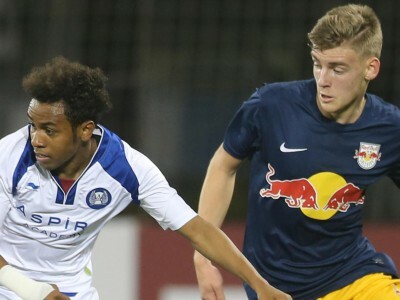 The fourth official signalled four minutes of added time, and they must have felt like an age for Aspire’s youngsters as Red Bull committed everything forward in search of an equaliser. Abunada performed repeated heroics to keep the ball out, as his team saw out the final seconds to complete a famous victory.